A Belfast schoolboy is to embark on the voyage of a lifetime after being selected to take part in one of the world’s most exciting seagoing adventures. Hazelwood College pupil Luke Robinson (17) will begin his life on the ocean wave in July when vessels arrive in Belfast for the start of the eagerly anticipated Tall Ships Race 2015. Having submitted an application back in October, Luke recently learned that he had been accepted on to a programme that will see him join the crew of the 110-year-old three-masted barque Alexander Von Humboldt II for 10 days, learning key sea skills such as setting sails, climbing the rigging and steering a compass course. 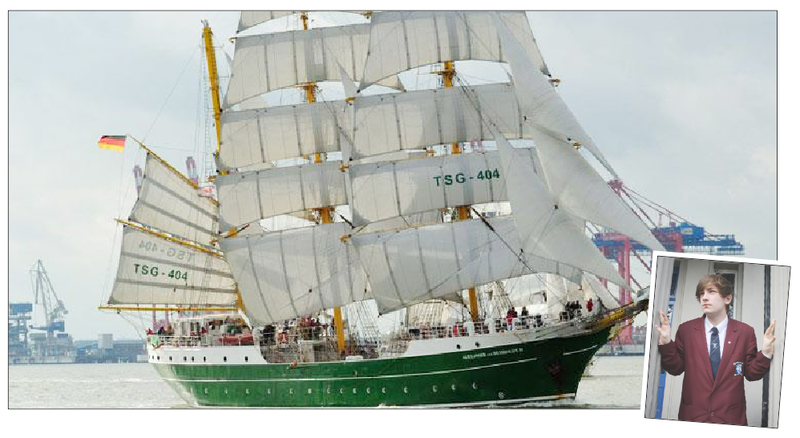 This year Belfast is the starting point of Tall Ships 2015. On the starting gun, competitors will race across the North Sea to Norway and from there on to the finishing line in Denmark. Dozens of the world’s most beautiful sailing vessels will dock in the city over the weekend of July 2 to July 5 and more than 500,000 people are expected to attend the free spectacle, boosting the city’s economy by an estimated £10 million. “It’s a fantastic opportunity and when the application process opened up and it stated that it wanted people with preferably no experience I grabbed at it,” said Luke. “It’s exciting that the race is starting from Belfast this time and I’m sure the crowds will be massive as we leave, heading over the top of Scotland and on to Norway. This is the third time that Belfast has welcomed the Tall Ships Race, but with the city acting as the first leg of the race for the first time, even more ships will be in port, with some 50 vessels, including 18 massive Class A ships, making Belfast their home for four days before setting off on their annual challenge. The ‘Alex-2’ is powered by 24 sails with a total area of 1.360 m². In favourable wind conditions, she runs up to 14 knots but if the wind doesn’t blow, a 750-horsepower engine will bring her to harbour. “We’ve had two days of training on the Lagan in smaller boats, working on team building and exploring the type of duties we will be expected to carry out,” added Luke. “It’s certainly not a holiday. On the boat I am on we will be working shifts of four hours on and four hours off, doing all the necessary jobs that crew members undertake and learning as we go along.